Pea soup on Thursday has been a tradition in Sweden since the Middle Ages. It stems from the Friday fasting historically observed by the Roman Catholic church as a reminder of Jesus’ suffering and death on Good Friday. Thursdays had a somewhat festive aura and peas were considered a luxury item. 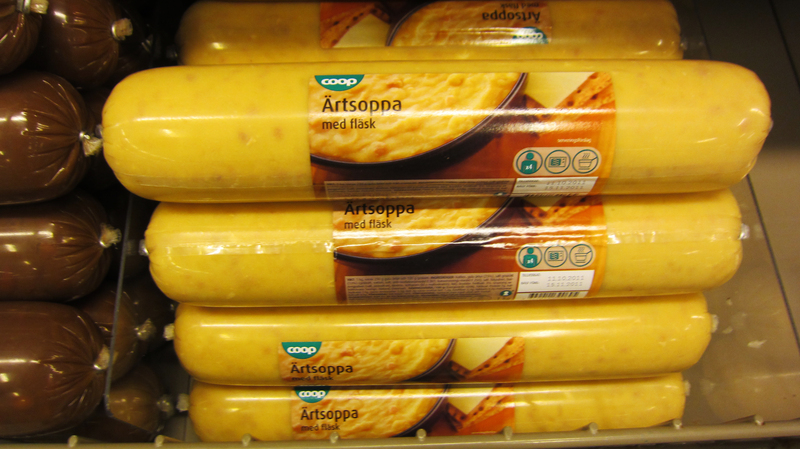 Pork was a common meat available in most homes and salted pork became a natural addition to the hearty ärtsoppa (EHRT-soh-puh) that was intended to hold people over on the day of fasting. By the close of the 1700s the aura of luxury had worn off and there are records of prisoners complaining about the recurring pea soup on Thursdays. Many Swedish school kids may feel the same. In the 1520s the Protestants abolished all fasting ‘rules’ that went along with the Catholic beliefs. Even though there were no longer religious restrictions on what could be eaten when, pea soup on Thursday was so entrenched in the culture the tradition has continued for nearly 500 years. It is still evidenced today in the plastic-cased pea soup tubes that are available in supermarkets year-round. An interesting complement to the pea soup tradition cropped up in the 1800s when warm punsch started being served along with the soup. The other common part of the traditional Thursday meal is Swedish pancakes with preserves (often strawberry). 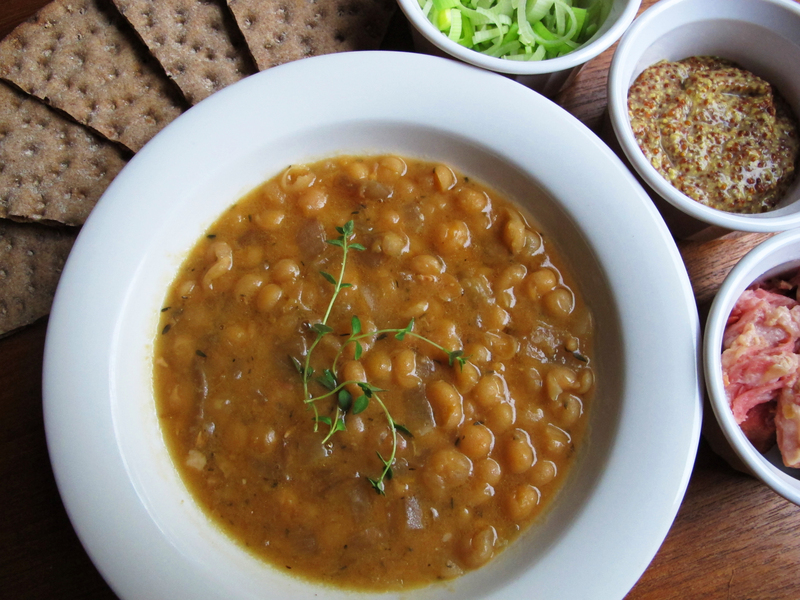 Although I find this soup to be perfect for fall, it’s year-round fare in Sweden. So if you are trying to decide what to make for dinner this Thursday, how about making it a Swedish meal? Whole, dried yellow peas are the most authentic but can be difficult to find in the U.S. Split yellow peas could be substituted if need be. I made my soup in the slow cooker but of course it can be cooked on the stove as well. Either way it’s easy to do and it freezes well. Adjust the salt and bullion cubes (because they are also salty) accordingly depending on what kind of meat you are using. Very salty pork can add plenty of flavor to the soup without needing to add much else. 1. Rinse the peas well. 2. Place all ingredients in the insert of the slow cooker, starting with the peas and ending with the ginger. Cover and cook on HIGH 6-8 hours until the meat is cooked through and the peas are soft. 3. Serve hot with stone ground mustard and finely sliced leeks. The meat can be broken up and left in the soup or removed and placed in a serving bowl. 2. Add the peas, water, and salt to a large stock pot. Bring to a boil and remove any skins or scum that rise to the surface. 3. Add the meat, onion, thyme, bullion and ginger. Simmer for 1-1 1/2 hours until the peas are soft. Keep an eye on the meat and remove it before the end of cooking time if need be to keep it from drying out. 4. Serve hot with stone ground mustard and finely sliced leeks. The meat can be broken up and left in the soup or removed and placed in a serving bowl. Thanks Claire. I was surprised to learn how long-standing the tradition is. And I do love yellow pea soup in the fall. Hope you enjoy the recipe. It certainly has room for all kinds of modifications according to your own personal tastes. I was also impressed with the discussion of the recipe but wondered if it dates from the middle ages, why the seasoning with ginger? Or is that a modern variation? I could only find split yellow peas and did it stove top. For most of the simmering, I had only salt and ginger in the pot for seasoning and a bit of lightly sauteed ham removed before it got dry. Added the bullion in the latter stages. I thought the artsoppa was very good with just the ginger and salt. I was very careful with the bullion and maybe next time would not use it. I wondered about the timing for adding the salt. With dried beans you don’t add salt until the end because salt early slows their cooking. I don’t think this recipe dates from the Middle Ages, just the tradition. I would imagine an earlier version would have been very simplified with only the peas, pork, and onion. The earliest Swedish cookbook is from the 1750s but I don’t have access to one to know if pea soup is in there or how it was made. 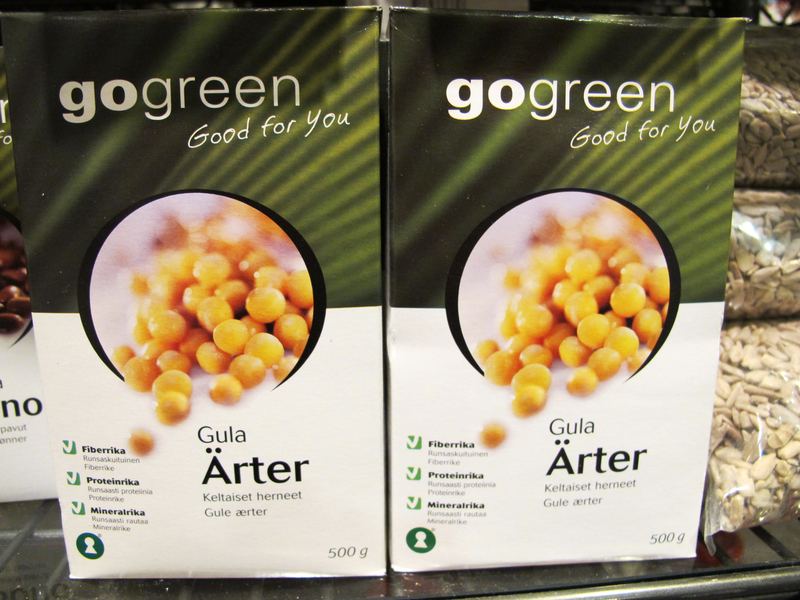 In terms of cooking beans, my Vår Kok Bok (essentially Sweden’s Joy of Cooking) recommends adding salt to any soaking water (1 tablespoon per liter of water) to help flavor beans as well as increase their intake of water. Then when it comes to cooking them they of course recommend draining the soaking water and then adding new water and salt right away to cook the beans. I hadn’t ever heard of adding salt slowing down the cooking time. Where did you learn that? I suppose there could very well be different takes on it. Glad you enjoyed the soup. Happy Thanksgiving! The cookbook at the Adobe Milling Company in Dove Creek Colorado offered the advice on adding salt later. I purchased a pound of Bolita beans and the instructions were to cook the beans until they were almost done and then add the other ingredients which were lean ham hocks, onions, salt and pepper. According to Brian Geiger this has to do with filling spaces in the protective layer surrounding the beans, that the water must penetrate through. Sodium, calcium, and magnesium all have this effect so it partly depends on whether you are cooking in hard water or not. It’s not that you can’t cook your beans, it is that it will take longer. Of course, however, peas and lentils requite no soaking to cook rapidly and Anasazi or Bolita beans cook fairly rapidly without soaking. I like to soak them the night before, anyway and always discard and rinse off the soaking water. I’ve not experimented or searched for practices extensively but just add salt near the end if I add salt at all. Pea soup in a plastic tube? Not the place I would have expected to find soup. Thanks for posting. And that’s not the only thing that comes in a sausage-like tube. You can get other soups that way, rice pudding, jam too. I still find it very odd. Happy Thanksgiving! Whole dried yellow peas can be ordered from Purcell Mountain Farms In northern Idaho, USA. Just Google up “Purcell Mountain Farms.” They have many varieties of dry beans, rice, chili peppers, and flour. I tried to obtain Swedish Brown beans from them but they were out of stock. I’m sure there are other US suppliers but the range of products offered from Purcell was amazing. Keep in mind, I actually did not end up ordering from them but their response on the stocking problem was very prompt. In Andalucia, Spain, a chick pea stew (potaje) is eaten in wintertime. I see a bit of similarity but Potaje has tomatoes, olives and some other bits and pieces. Mmmm. A chick pea stew sounds really good. I’ll have to look that up. Thank you for the tip. Every household seems to have his own recipe but it’s heavenly on a cold day! Coincidentally I too just made pea soup today, on a Thursday!! LOL. Now I am intrigued by this chickpea soup….